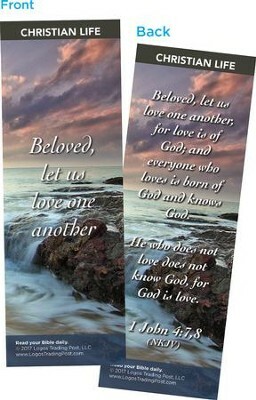 Pack of 25 Christian bookmarks with full color artistic design and encouragement on front and back. 2" x 6". Makes a great addition to greeting cards, add to gifts, or handout at Church. Printed in Turkey. Proceed supports spread of the Gospel in the Middle East. Front: Beloved, let us love one another. I'm the author/artist and I want to review Beloved, Let Us Love One Another Bookmarks, Pack of 25.